Tampa Bay head coach Raheem Morris won’t label Black position-wise, though he thinks he can assist in a number of ways. “He is a safety that has the ability to play corner [and is a] hybrid athlete that can do multiple things because of [his] instincts and awareness,” he said. Tampa Bay got a steal with Black, how a team like Jacksonville could pick a receiver in the 4th with Black a character guy at a position of need sitting there is beyond me. Good luck to him, Tampa is really developing. Bucs had a terrific draft! Can’t wait to root for Ahmad in red and pewter on Sundays. 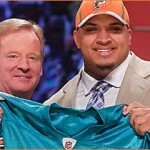 Just thought you should know, Mike Pouncey was also on Paul and Young Ron on 5/2 at 9:00 AM. Here’s a link to download the audio.